Mr.Butler: serial plagiarist, liar and pretend historian. One inclusion into the centenary events rarely mentioned is the adaptation of "The Other Side Of The Night," based on the book by Daniel Allen Butler. It was announced via a variety of sources (mainly Butler's Facebook and Wikipedia page) that he had met with representatives of BBC Worldwide to film an adaptation of his book, with David Attwood signed on to direct. By August, it seemed that a script was in preparation. And then it went quiet. For those readers unfamiliar with Butler, I will add a few lines. He was the author of "Unsinkable" which was released shortly after James Cameron's film emerged. The ailing patriarch of the Titanic research community, Walter Lord, was sufficiently impressed by Butler to tell him that he was his "successor." No doubt this boosted Butler's ego as well as his book's sales figures. I don't doubt that Lord was sincere, but he was so polite, he would say the kindest things to people, even those he didn't particularly like. But how very odd that not one letter from Butler is in Walter Lord's archive, lovingly preserved in London, and which I have examined many times. Butler was a member of one of the original Titanic mailing lists at TITANIC@LISTBOX.COM before he was ejected by Michael Cundiff. I am not too sure of the reason, but if his antics on the alt.history.ocean-liners.titanic newsgroup are any indication, it is because of his highly unpleasant manner, berating those whom he perceives as pedalling faulty research ("Do your homework," he would disparagingly tell people) and telling all those who would listen that he was the Chosen One, the annointed successor to Walter Lord. Butler's behaviour drove many people from the newsgroup. Dan's nickname was "The Hammer" but many preferred to just call him "The Ham." Mention of his name alone causes some in the Titanic community to heave, as he offered a $500 prize for "extra money for college" for the best essay on the Titanic. Before the winner was announced, via his Quill Driver Gazette website, he went very quiet and the competition was never mentioned again. He also promised to donate money to the "Titanic Hearts" project in 2002 to raise money for cancer research in honour of 10 year-old leukaemia victim Daniel Toole. Of course Butler reneged on his promise but did offer to provide a personalised copy of "Unsinkable". So, what is so repellent about Mr. Butler? After all, his books have garnered very high ratings on Amazon. That is true, but his books tend to be accepted by those mesmerised by style over substance. Dig deeper, and you'll find historians who are aghast at his research, and there are suggestions of plagiarism other people's books, including, it is mentioned, Walter Lord's "A Night To Remember," and just summarising other people's works rather than doing any original research. It isn't just the Titanic story that has been raped by Mr.Butler either as this archived review of his treatment of the sinking of the Lancastria shows his "The Age of Cunard". I can't profess to be an expert on Butler and his writings. My own experience of "Unsinkable" was severely truncated after I bought a copy in early 1998. At the time, I bought anything with the name "Titanic" on it but I became more circumspect after imulsively buying Butler's book. This requires a little explanation: my main focus of interest in the story of the "Titanic" is that of the Californian. She and her Captain, Stanley Lord (no relation to Walter), were blighted as "The Ship That Stood Still:" aloofly paying little attention while a nearby ship sent up rockets and disappeared into the night...at the same time as the Titanic was doing the same thing. The courts of the era - and popular opinion - is that the two ships were about ten miles apart. Some apologists believe Captain Lord's story that other ships were involved. So, I trundled off home to read "Unsinkable" and turned straight away to the section dealing with the "Californian." And there I saw a chart of the ice field towards which the Titanic was steaming, and the legend denoting the position of the "Californian" , determined by 'The Ministry of Trade' [sic] in '1987' [sic]. The first page I opened and immediately saw two glaring errors. Had I not known more about the case than Mr. Butler I would just have accepted these "facts" as, well....facts. But I did know better. And others did too, and a tedious, but necessary trawl of "Unsinkable" was necessary to tease out these factual abortions. For instance, he writes that the Titanic's bridge officers were alerted to the presence of a nearby ship at 11.50. But this NEVER happened. This is a myth that Geoffrey Marcus made up for his book "The Maiden Voyage" and has been told and re-told ever since. The 1912 testimony is clear on this: the lookouts never alerted the bridge about the mystery ship. And yet, a few minutes check of the 1912 inquiries, available on line when "Unsinkable" was written and easily searchable, would have destroyed this myth. There are other examples that would have been corrected with a bit of basic research rather than copying from other people's books. Butler's attitude to this "error" is quite revealing for someone who professes to be an historian: he wrote about the 11.50 notification because that is what should have happened. History would be so much simpler if everyone had this same modus operandi. But it would be quite wrong. And deceitful, too. Another obvious error is that Butler has Hichens turning the ship's wheel the wrong way! Other expert opinion can be found on Encyclopedia-Titanica for instance, should one has the desire. There are similar such errors in "The Other Side Of The Night," and my friend Sam Halpern, a man of keen intellect and sharp technical mind, described the book succinctly: rubbish. Dan's disdain for revisionism is clear on many points: he berates those of us who are skeptical about the rescue ship Carpathia's rush to help, but can't quite see an obvious point. The Captain of the Carpathia thought he had covered 58 miles in about 3 1/2 hours, giving a speed of about 17 knots. But the Carpathia was a 14 knot ship, with old engines that almost certainly couldn't be pressed so hard. What is known, and which Butler forgets, is that the Titanic's radioed SOS location was wrong - 13.5 miles too far west, in fact. If one factors in this reduction in distance, the Carpathia's speed becomes more manageable. Mention of the Titanic's SOS location reminds me of another instance. Every year, Titanic enthusiasts give a mnute-by-minute re-enactment of the sinking on Facebook. Butler was no exception. He said that the collision point was the wrong SOS location. When I corrected him, he snarled back, "Save it for the rivet counters" (this being a fairly light-hearted way of describing those intrigued by the technical minutiae of ships). I found this to be worrying; a historian (supposedly) who not only does not know the facts but refuses to budge when corrected. And, like most authors and film-makers (the diabolically 1953 film "Titanic" strangely being the sole exception), Butler has the rockets fired by means of a match, whereas they were fired by tugging on a lanyard. Regarding the Californian being sunk in World War 1. Butler tells us that only two on board "were scalded" during the U-Boat attack, "the only injuries suffered in the attack." This is just not true. A crewmember by the name of R.J.Harding was killed in the attack. The rescue ship Carpathia is described as entering the edge of the icefield [at 2.45am] "where the Titanic had come to grief." This is not true. There were scattered icebergs in the area, but the ice field was centered about 50 degrees W. By 2.45am, even at 17 knots, the Carpathia was still about 25 miles to the south-east of the icefield. Captain Smith is described as being convinced - like Quartermaster Rowe - that the mysterious ship seen from the Titanic's bows couldn't be more than 10-12 miles away. Nowhere is this statement to be found in any testimony or private source. In fact, most witnesses put the strange light as being only 5 miles away. Captain Smith is now described as muttering (and overheard by Rowe) that he "wanted a 6 inch naval gun to wake that fellow [the other ship up]." Again, one looks for a source for this comment but none is forthcoming. None of Rowe's statements even mention this. A similar line is mentioned by an actor in the 1958 adapatation of Butler's hero's book "A Night To Remember." Captain Lord's chief advocate, Leslie Harrison (who is described as passing away in 1996 [sic]) is referred to as taking up Lord's case "for political reasons." No proof is offered for this statement. From a study of the records, Harrison took on Lord's case simply because he felt a duty to protect the reputation of a fellow mariner who belonged to the same shipping union that Harrison was secretary of. We are told that Harrison petitioned the board in 1958 when he was first approached by Lord, but it took 7 years for the Board [of Trade] to respond. This is absolute fiction. Harrison informally contacted the board between 1958 and 1965, but it wasn't until that latter year that an official petition was submitted. We are told that Captain Lord altered the Californian's logbook. There is no proof that he ever did so. It was one of his officer's responsibilities to write up in the scrap (temporary) log what had transpired during his watch when he had seen rockets being sent up by the other ship, another officer transcribing these notes neatly into the official log. It could be that the first of these officers (Herbert Stone) is just as guilty of omission as Captain Lord is accused of being. At his first meeting with Leslie Harrison, Captain Lord is reported as saying "I am Lord of the Californian and I have come to clear my name!" According to Harrisons later writings, the italicised part of this was never said. We must take his word for it as Harrison was the only one present with Lord. The Titanic's radioed SOS position is "roughly 12 miles west" of her actual position. Not only is this figure wrong, but the next sentence beggars belief: this is, apparently, a "small enough error to be inconsequential." This is a gross misstatement. It is so "small" as to prompt the re-opening of the Californian Incident in the UK Goverment in 1990. It is also "small" enough to force a re-assessment of the Carpathia's navigational claims. It it also so "small" that it hampered search expeditions to find the wreck for over 5 years. Butler propagates two errors created by researcher Leslie Reade, without attribution. He says that the lights of a ship seen by the Carpathia during its rush to the rescue was the Californian itself. This is impossible, the bearings are all wrong. The Carpathia, the green flare fired by officer Boxhall from his lifeboat and the Californian were all roughly in a line. The mystery lights were seen well off to the north, to the starboard side of the Carpathia's track. Also, use of another of Reade's faulty hypotheses plagues Butler's work: he says that when he left the Titanic, the mysterious ship he was watching was showing its white light. But the Californian, facing somewhere towards the west, or south-west, would be showing its red light. 2nd Officer Stone's inability to manage his financial affairs is seen as a evidence for his insecurity. I don't see the logic. Also, Stone is described as confiding to his wife that he was too afraid to press the issue of the rockets with his Captain. While it is true that Stone did confide to his wife that he was sure the rockets he was watching were those of distress rockets, he never said he was afraid of Lord. In an effort to make Captain Lord's career post-Californian sound as decrepit as possible, Butler says that Lord was at "the very bottom of the ladder [career wise]." What Butler does not tell us is that Lord was in command of bigger, newer ships and earned more money than he ever did with his old company (the Leyland Line) when he captained the Californian. We must also question Butler's description of Lord's job - ferrying nitrates - as little more than shipping bird droppings around. ...and Butler still propagates the old 11.50pm Crows Nest Bell ring. But with a twist. Now 4th Officer Boxhall goes to the port bridge wing to view the object seen from the crow's nest. He says nothing of the sort at the enquiries. In fact, he was below at the time making his inspections. The first distress rocket didn't go off until about 12.35am. In fact, if the crows nest had seen the nearby ship that early, and the first rocket wasn't fired until a few minutes before 1.00am (as Butler says), then what on Earth were the bridge crew doing for nearly 70 minutes, given that the danger to the Titanic was known soon after midnight? Also, Boxhall is described as seeing the "port" (red) light of the other ship at this time, flatly contradicting the Californian which was showing its green light. In America, Boxhall says that he saw the green light first. And this was in 5 minutes. The remainder of his book is riddled with so many errors, that considerations of space, time and tedium prevent a full "review" here. 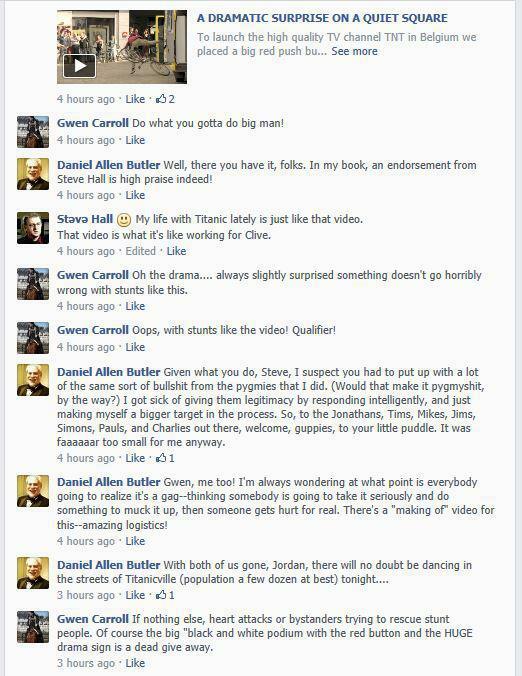 Butler's exodus from the Titanic newsgroup resulted in him emerging as the main force on RMS Titanic, Inc's Facebook page, a force to fight disinformation. How ironic! Acting as "the final arbiter" of all things Titanic, he informs readers of technical details (gleaned, without attribution from "Titanic: The Ship Magnificent") and passenger and crew information (again, gleaned without attribution from Eneyclopedia-Titanica). He tells readers that Anne Isham, one of the few 1st class women not to survive, had a Great Dane on board (there is no evidence that she did; this story actually originates from Marty Crisp's work of fiction on the disaster)... that 2nd class family the Harts left their pet French Bull Dog in their cabin when they went up on deck (they didn't; they left Eva's huge teddy bear; she had seen a French Bull Dog on deck days before and was intrigued by it but didn't get one until many years later)...and so on. He also delights in addressing people as "laddiebuck" when he hypocritically calls people up for lapses in their research or opinions! Whereas Walter Lord would be polite and accommodating, his protege is arrogant and rude. Hardly a great claimant to the title of "final arbiter." I am truly horrified at the thought of all the disinformation that he will be spreading on his new website, "RMS Titanic Remembered"; it's little more than a glorified advert for his writing efforts. And woe betide you if you offer even the slightest criticism of his hero Walter Lord! I mentioned that Sylvia Lightoller had written to Lord and had alluded to some dark information that no-one knew about. Lord wrote a gushingly sycophantic letter back saying that he had all the information he needed as Commander Lightoller's testimony was so wonderful. But if only Lord had written to Sylvia then he might have heard about the ridiculous claims that she made about the Titanic, and which were to appear in the book "Good As Gold" over 5 decades later. Walter Lord could have destroyed these claims many years before they even reached the printed page. He didn't. A wasted chance. Butler was furious at this suggestion of mine! Butler was, for a time, a resident on RMS Titanic, Inc.'s "promenade" website, but now he seems to have vanished. Did he leave, tired,as he says of trying to educate the ignorant, or was he, as I suspect, banned? 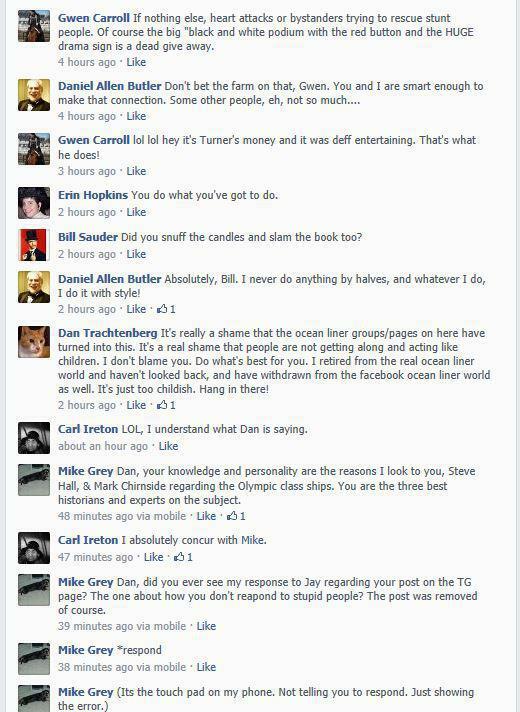 His postings on the forum have been enlightening as to how his mind works: he has accused salvagers of destroying the Titanic's crows nest when they removed the bell, even going so far as to tell Titanic enthusiast Mike Cundiff that he had seen the video of this destruction (no such video exists, of course). Butler has also pointed the finger at those who participated in the 1990's Dr.Ballard trip to the Lusitania, suggesting that the photographic record was inadequate forcing those involved to exaggerate or guess at the condition of the wreck later on, for instance, when painting pictures. When these blatant lies were corrected, not word one of apology, conciliation or even an acknowledgement was issued from Mr.Butler's hate-filled mouth. So, how did Butler's and my world cross? I knew of his vituperations but ignored them. As he was keen on venting on an unmoderated forum, he could say what he wanted with impunity. But in 2009, Butler issued a glowing review of my electronic book "The Titanic and the Indifferent Stranger" on the newsgroup, one of the few compliments he ever handed out. Of course, I was wary but appreciative. His publisher, Casemate, said that if I could write a review of his book they would make sure a sound-bite appeared on the back cover which would generate publicity. Now, publicity is one gift no writer ever dismisses. The Titanic Historical Society had already tried to stifle my book; they refused to run a review as they would not be selling the book (electronic books are not very popular it would seem, just ask any Kindle owner). The real reason is that my book ran contrary to a long held, but unwritten dictum within the Historical Society echelons: that Captain Lord was innocent of all charges of negligence, his crew did not see the Titanic's rockets etc. I had already tried to elicit interest from UK and international news agencies wth a press release and a copy of my e-book, to no avail...and then later, to production companies, with a stunning 0% success rate. The main problem I have with Butler's book is his depiction of Captain Rostron of the Carpathia as the man who could do no wrong, and Captain Lord as the man who could do nothing right...or do nothing at all considering that his ship sat idle while rockets went up. To this end, Butler consulted a psychiatrist, who painted Lord as sociopath. The worldwide press heralded this as "fact"...but this can't be the case. Butler's treatment of Lord's life after the Titanic is superficial and lacking much detail. If Lord was such a tyrant, why would people be willing to risk their own reputations to help him find employment after the Titanic disaster forced his resignation from his shipping company? Why did crew members on other ships sail up for him, not once, not twice...but up to seven times? Why did people give him great testimonials? This doesn't sound like a sociopath to mel; but when you want a tidy conclusion from such a messy story, what do you expect? I have spent years examining just about every scrap of information regarding the Californian and even I couldn't come up with any definite conclusions. But without the conclusions drawn from a dubious posthumous "psychiatrist's couch," and with all the players in the drama dead, and (it would seem) a selective use of original documents, "The Other Side Of The Night" contains nothing that is new or original. And since Butler is keen to utilise cod psychiatric conclusions, let me deduce my own: based on those who gush lavish praise praise upon the man, he is little more than narcissist who surrounds himself with sycophants. Armed with these concerns, I tried to contact David Attwood, the putative director, with my worries, sending him a complimentary copy of my book via his agents, Independent Talent, and offering myself as an assistant to his research. No reply. So, I sent a follow-up letter and again got no reply. I then tried to contact "The Other Side Of The Night's" production office via the BBC press office, a task easier said than done as they don't deal with members of the public. They had no information about such a project and passed my query on to the Los Angeles office. After much delay, they said that they couldn't comment on "book options." So, there we must leave it. Is the project an active one, or one that exists in the mind of Mr.Butler? We will have to wait and see. But if he is to be retained as a historical consultant, I truly do despair of the possible quality and content of the finished programme. I am reminded of the BBC's Christmas 2010 dramatisation of the story behind "Live Aid," named "When Harvey Met Bob." Its lack of adherence to the known facts has elicited much upset amongst people, and the programme did start with a disclaimer which amounted to, "We know its an exaggeration, but who cares?" which didn't help matters. I hope Butler's film, if it does happen, does not fall into this hubristic category. The ugly spectre of Mr.Butler has risen again. Although an interesting discussion has erupted on an internet newsgroup about the accuracy of Mr.Butler's calculations (which seem to be justified), certain alterations and defamations occurred on the Wikipedia page describing his work. As you can see from the log of changes to the Daniel Allen Butler Wikipedia webpage, someone - and God knows who - with the IP address of "108.45.106.43". The exchange got quite heated, and the unknown person suggested that Butler was using Wikipedia to advertise himself, a clear policy of the guidelines on that website; this is a practise that Mr.Butler continues to use to this day - for instance using the 2013 Syrian crisis to try and sell more books. After a discussion over whether the Butler page should be deleted (it wasn't), it's permission status was changed to "read-only" to prevent further grand-standing by Butler and changes by the strange intruder. However, Butler then decided that I was the author of those alterations, and engaged in quote a libellous tirade against me: see for his own entry to a user, and a reply is here. One little problem, which I would have thought a capable researcher would have checked up on and which : the IP address "108.45.106.43" translates to "pool-108-45-106-43.washdc.fios.verizon.net". Or put another way: this is a machine on the verizon.net network in the Washngton DC area. Not only am I based in England, near Cambridge, and therefore not near Washington DC, but at the time I used the PCs provided by Cambridge Council, in their libraries (I sometimes use my mobile (cell) phone on the UK O2 network but the ergonomics make editing Wikipedia pages, for instance, difficult). Also, none of the IPs recorded as being used for the alterations belong to the Cambridge Council network or to O2. I certainly hadn't looked at the Butler pages for many months. Butler's rant can be found on this page, along with my reply and IP address; after I complained both Butler's comments and my retort were removed from the current page, but the logs remain to plague Butler and his questionable accuracy. 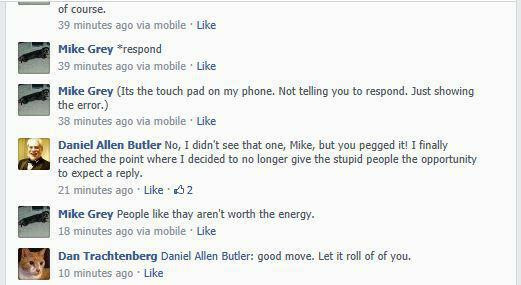 Of most interest is the fact that Butler says, upon being told that the Verizon user's IP could in no way be traced back to me (and no apology from Butler for his rant), that this information would be very useful the next month - ie November 2011. One wonders what why? Perhaps an announcement that his Titanic movie was a definite "go"? Perhaps, because as Butler also says, "There are two errors involved here [regarding the alledged abortive making of "The Other Side Of The Night"]: first, that such an option was signed and that the individuals identified as the director and writer assigned are statements of fact, not grandstanding, and if asked I can provide the correspondence to prove this." Finally, in an attempt to discover the truth, in 2013 a friend contacted Jane Tranter, executive vice president of programming and production at BBC Worldwide in Los Angeles, and wife of David Attwood. If anyone knew the status of "The Other Side of the Night" she would know. She said that, "the project never got made as the bbc decided to find other ways to mark the titanic anniversary". Now, it takes a long time to make a drama; Julian Fellowes mess took 11 months from filming until it reached the screen, and many months before that in writing and "researching" [sic]. It must have been patently obvious to Butler in October 2011 that his drama wasn't going to be made, with only 6 months till the centenary...and yet he was still perpetuating his myth as truth at such a late date. Here are a few other little things: on one of the dates mentioned (23rd September) when "108.45.106.43" was active on the Wikipedia site, I was actually at home, near Cambridge, preparing for an interview with Hills Road Sixth Form College for a web systems developer. You can phone up the Human Resources Officer, Michele Nightingale, and ask her yourself. I had that interview on 28th September and went to visit my wife afterwards. She was taken to hospital nearby that afternoon with pneumonia and kept in overnight. I was with my wife, attentively at home, nursing her for the next few days (unless Butler is suggesting that I rushed off to Washington DC to perform the "vandalism") and, against my wishes, she went back to work the following Monday, October 3rd, when I collected her from the bus stop. October 3rd is the date on which "108.45.106.43" was altering the Wikipedia entries and having an on-line row with Butler. 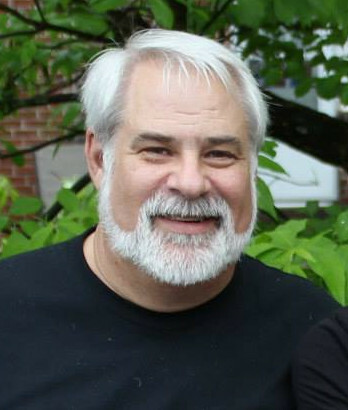 Dan says, "we have a history of personal and professional antagonism (based on a refusal by me in 2009 to endorse a specific work he authored)." Now, regarding your "ebook." I will be glad to do whatever I can to "spread the word." Your timing is fortuitous, as I am just getting the galley proofs completed, and this is, of course, the last chance I have to make any changes, deletions, or additions to the text. I'll be certain to get a mention of "The Indifferent Stranger" into the Author's Note, with along my recommendation. While your work doesn't duplicate mine, it does compliment much of what I describe in "The Other Side of the Night," and I have no problem with mentioning this--and putting in a plug for you--while I'm doing promotional work for my book--signings, lectures, and such. In addition, I'm going to be attending Book Expo America in May (it's the big North American publishing trade show) where "The Other Side of the Night" will be launched. I'd be happy to see who might be interested in the electronic publishing community on this side of The Pond, if you like. If I might make a suggestion, becoming a member of the site Facebook is a good way of getting word out of your e-book. It's one of the platforms I'm using to promote "The Other Side of the Night." Come to think of it, I'll put a word in for you on my pages there this weekend. He never put any comments on my book on his Facebook site, in the author's note or elsewhere. All of this shows quite comprehensively that Butler did promise to endorse my book and he broke that promise. Dan writes, "Mr. Lee repeatedly deletes the information about my latest book (Shadow of the Sultan's Realm), "
I did no such thing. Since I am not an expert about this area of history, I cannot comment about his accuracy in this field or otherwise. "Just in passing I should point out that the only way he has been able to get his own book on the Titanic has been to self-publish, as no reputable publishing house deemed it worth producing as a hard-copy mainstream publication"
This is hurtful and untrue. The reason why I did not "go mainstream" is because the editors and publishing houses take a disproportionate amount of the profits. I did decide to go with a printed version after suggestions from other people, and at least one company, (Haynes, where I did some research for my book) did show some interest. The accusation in one posting by Butler, that I was jealous because he was a "more successful Titanic author" than myself is also untrue. Dan says, "He has also made statements in the Wikipedia article to the effect that I have committed acts of plagiarism, without providing substantiation for the allegation"
I did no such thing, and the Lancastria website would say otherwise. Why don't you ask them? I did no such thing. The mysterious Verizon person did this. It is a shame that Mr.Butler did not take the opportunity to apologise to me for the accusations he made. But, struggling to maintain continuity with his past antics, he has gone very quiet. And now his lies and inneundos are recorded on the internet for all to see. He was conciliatory on a Facebook group, saying that he "shoots from the hip," and we can see this in the rantings above. One last thing, Butler: my title is not Mr., but Dr. If you want to verify this, I suggest that you contact the Registrar's Department at the University of York in Heslington, York, England to confirm this; to help you, the date of my oral examination, that I passed, was March 18th, 1997, and I graduated on July 10th, 1997. If they give you no joy, contact Professor Bob Wadsworth, who was my internal examiner (my supervisor has since retired). Since you're such an Ace, Gee-Whizz researcher, I won't give out their contact details, as I'm sure you can find them out for yourself. But I guess that's too much even for you, isn't it? Updates: In April 2012, I received an irate email from someone who lambasted me for making a mistake in the name of a relative who was on the Titanic. I was bewildered as a search of my website made no mention of said person. I enquired why my correspondent should think this, and he sent me copies of email he had shared with Butler, who said that it was a mistake that people like "Dr Paul Lee" had made. In a shrewd diversionary move, Butler had blamed me for making a mistake, no doubt giving him time to correct the error which he had propagated on his page. In 2013, things became even more embarrassing for our favourite braggart. A friend who was on Facebook reports that Mr.Butler, who had claimed that Wallace Hartley, the band leader on the Titanic played the Methodist version (Propior Deo) of "Nearer My God To Thee" because he was friends with the arranger of the melody, Sir Arthur Sullivan (of "Gilbert and Sullivan" fame). Butler said that he was told this by Sullivan expert, Professor Jeffrey Richards of Lancashire [sic] University when he was researching "Unsinkable" and said that Richards may have access to archives and records that are not otherwise in the public domain. My friend wrote to Richards at LANCASTER University and was told that he had never heard of and had never encountered Daniel Butler before. Furthermore Richards had no knowledge of a Hartley-Sullivan link and diligent research into other archives and contact with groups including the Sullivan Society has revealed no evidence whatsoever of a connection between the two men. 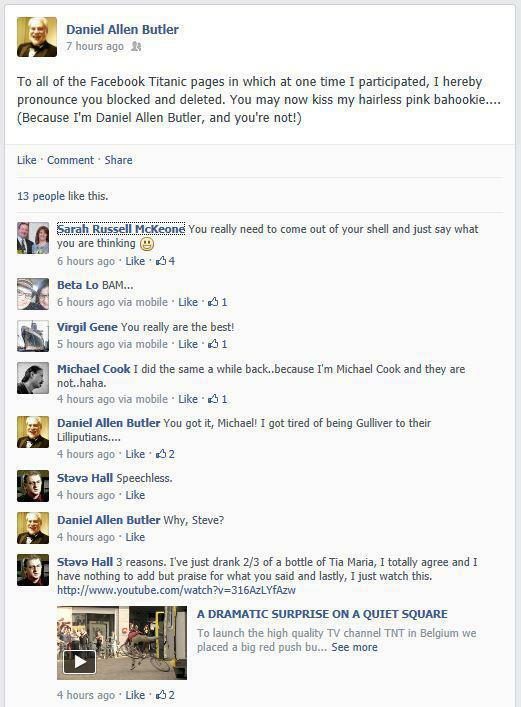 When Butler was exposed for lying, and indirectly for spamming the groups about his anti-violin tirades, he was ejected from five Facebook groups in that same weekend. However, he was too pompous and concieted to concede that he was in the wrong and had been removed, and in much the same way as an abysmal worker, when faced with dismissal, says "You can't fire me - I resign!" he told his friends on Facebook that he had "blocked" and "deleted" them! ; he also said that he "was tired of being "Gulliver to [his enemies] Lilliputians," and that he had "got sick of giving [his foes] legitmacy by responding intelligently [sic!]." Butler's rants over the legitimacy of the Violin enraged Aldridge's Auction House who were planning legal action for libel...and funnily enough, his tirades against the violin disappeared from his personal website and his "RMS Titanic Remembered" page, as if that repaired the damage and destroyed the evidence; but screen images had been obtained and already forwarded to Aldridge's. I applaud and encourage their future efforts in exposing this lying braggart. Update: On 20th September 2013, a diatribe against the violin has reappeared on his page, but as you'd expect it meanders around in circles and is tedious to read. About par for the course then. But he probably needs the publicity; having broken promises (a common theme!) to release e-book versions of his tomes, he obviously feels the need to stew on something, having given up on his "RMS Titanic Remembered" website, which he left uncompleted. I am not bothered; at least the lack of electronic versions of his books prevents a potentially new audience from being exposed to his "research." As was said in "The Man Who Shot Liberty Valance," 'When the legend becomes fact, print the legend.' In the case of Butler, I'd recommend striking out the word "legend" and replace it with "lies." It is only to be hoped that his latest books, ("The Field Marshall" about Erwin Rommel, "The Last Field of Glory: Waterloo, 1815" and "But For Freedom Alone", which concerns the Declaration of Arbroath) are not mere rehashes of other people's work. But Butler's spectre could taint other projects too; he is a consultant on the "Honor and Glory" computer game along with noted "expert" (read: cherry picker) Parks Stephenson, and this threatens to negate the worth of the project, rather like putting excrement on top of a gourmet meal. And Butler is an advisor on the World War 1 dramatisation "They Call It The Great War" with Tom Lynskey. Without a hint of irony, the project says one of its aims is "setting the facts straight." Strange for a man who gets his facts wrong and copies other people's work. And now it looks like his "RMS Titanic Remembered" website is gone too. He writes, "In five days, my ownership of the domain name will expire, and when it does, the website itself will be coming down. The reason why I'm allowing this to happen is simple: that ship has, pardon the pun, sailed. Traffic has dwindled, as interest in the ship and the disaster -- apart from the occaisional publicity stunt or bit of huckstering -- has fallen off dramatically since the centennial four years ago. I've largely moved on from the Titanic, personally and professionally, as I've already said (and written) everything of substance that I have to say on the subject. While I stand by everything I've said, and neither recant nor retract any of it, there's nothing more for me to add, and while I plan to be around for the sesquicentennial in 2062, all that will remain as food for thought or discussion will be trivia and minutiae -- or worse, outright exploitation. Frankly, I have no interest in being involved in either...."
To go to my Titanic page, click here.